The 2017 field season report from our Citizen Wildlife Monitoring Project is now available! The following is the Executive Summary from our latest report. The full report is available as a PDF or online flipbook. Learn more about this citizen science project on our wildlife monitoring webpage. Or check out our Flickr album for our favorite photos from the past field season! For more than a decade, the Citizen Wildlife Monitoring Project (CWMP) has conducted research using remote cameras, wildlife tracking, and DNA sample collection to study Washington’s rare and sensitive wildlife through citizen science. Led by Conservation Northwest (CNW) in partnership with Wilderness Awareness School and other groups and agencies, the Citizen Wildlife Monitoring Project is engaged in monitoring wildlife presence and activity in critical areas for wildlife connectivity, conservation, and habitat. Citizen scientists from this project continue to contribute valuable new information about the presence and distribution of wildlife in our state through both remote camera surveys and snow tracking. CWMP often covers geographic areas beyond those of ongoing professional research efforts, supplementing and strengthening the work of agencies, conservation groups, biologists, and other collaborators on our Advisory Council. During the 2017 remote camera season, 86 volunteers contributed more than 3,500 hours to the Citizen Wildlife Monitoring Project by attending trainings, installing, and maintaining 72 remote camera installations in 30 survey areas in Washington state and British Columbia. CWMP’s monitoring efforts are broken into two projects: remote camera monitoring (annual monitoring with heavier effort from May-October) and snow tracking along Interstate 90 (typically December-March). 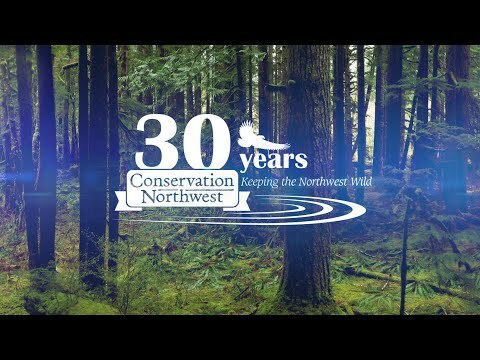 At the culmination of each project season, a monitoring report is prepared and made public through Conservation Northwest’s website. This report focuses on our results from the 2017 remote camera monitoring year. Separate snow tracking reports are available on our website. Detect the presence of gray wolf (Canis lupus) in the South Cascades. Detect the presence of wolverines (Gulo gulo) in new locations and continue to monitor known populations in the North and South Cascades. Detect grizzly bears (Ursus arctos) in the North Cascades Grizzly Bear Recovery Zone. Monitor the presence of a wide variety of wildlife species in the I-90 Corridor (Snoqualmie Pass to Easton). Document transboundary Canada lynx (Lynx canadensis) presence in northeast Washington and southern British Columbia. *More detail on our objectives for this season are available in the Program Summary section of the full report. With the assistance of Conservation Northwest program staff, contractors and our Advisory Council (listed in Acknowledgements), survey areas were established based on our target species. Each survey area may contain multiple remote camera sites. Program volunteers managed two grizzly bear survey areas, eight wolf, eleven wolverine, and five multi-species areas in the I-90 corridor. There were also three survey areas in northeast Washington’s Kettle River Mountain Range for lynx monitoring, with our partners at Selkirk College in British Columbia also maintaining one lynx survey area in southern British Columbia’s Rossland Range. The continued documentation of wolverines in Washington’s Cascade Mountains. Our citizen science teams documented wolverines in the southern portion of the North Cascades on eight separate occasions, including two individuals visiting a site together. We continue to work on improving our coverage for difficult to access locations, so that bait and hair snares can be checked on a frequent interval when target species have been detected. Although our teams recorded no Canada lynx on the Washington side of the border this year, the efforts of our volunteers have contributed to a larger study by our partners at Washington State University. Dr. Dan Thornton’s Mammal Spatial Ecology and Conservation Lab has been able to add our data to their larger study focused on distributions and population density of the Canada Lynx in the Kettle Range and Columbia Highlands of northeast Washington, and has developed a methodology for large-scale, long-term monitoring of lynx in Washington state . Through the CWMP, Lui Marinelli’s students at Selkirk College were successful in documenting Canada lynx in southern B.C.’s Rossland Range. These efforts contribute to furthering our collective knowledge and conservation efforts to protect this rare and sensitive species. Our volunteer teams documented fishers at two survey areas in the South Cascades. Both locations are in close proximity to where fisher reintroduction efforts have taken place in Washington led by the Washington Department of Fish and Wildlife (WDFW), National Park Service and Conservation Northwest. Fisher photo documentation provides visual evidence of the health of the animal at the date the photo was taken. Reintroduced individuals have internal radio transmitters providing location information via overhead telemetry flights; however, the lifespan of these devices will not provide information on the following generation. In the coming years, we plan to expand our fisher monitoring and expect our efforts to play a role in documenting the presence of offspring and provide further evidence of an expanding population. American martens were recorded at ten different survey areas in the Cascades. While not a target species for our project, data collected on martens is shared with our Advisory Council members carrying out research on these animals. Animals documented at I-90 Corridor survey areas for the 2017 season were of particular interest due to the completion of two large wildlife underpasses at Gold Creek in 2014, recent completion of several smaller undercrossings nearby, and the increased opportunity for movement of wildlife. CWMP’s survey areas are located within close proximity to these new highway-crossing structures. Easton sites recorded presence of seven different species in habitat adjacent to the highway. The presence of this high number of species serves as an example of the crossing structures’ utility for wildlife to travel safely under I-90. Since the underpass areas have transitioned to a restoration phase, we expect to see wildlife making more use of them and adjacent areas. As construction continues on the first wildlife overpass, we will continue to pay especially close attention to wildlife activity nearby, including monitoring efforts after completion (expected in 2019). The work of Conservation Northwest staff, interns, volunteers and partners through the Citizen Wildlife Monitoring Project increases our understanding of wildlife on Washington landscapes and in the transboundary regions of Washington and British Columbia. Not only does visual wildlife documentation influence research and policy decisions, these animal images create a narrative and face for our wildlands that informs and inspires both project participants and the public. The Citizen Wildlife Monitoring Project emphasizes the importance of monitoring and conservation efforts to ensure a stable future for wildlife species that call the Northwest home. Read more in the 2017 Citizen Wildlife Monitoring Project Report here!